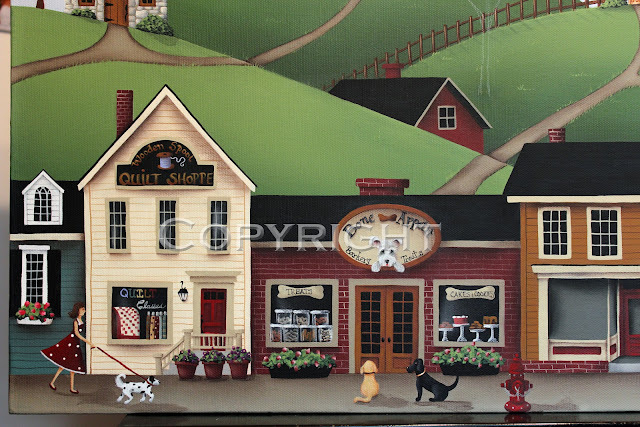 Remember when a customer asked me to personalize my Tea Shoppe print and make it into a Dog Treat Barkery? That's where I got the idea for this new painting. I was hoping to get this painting finished today, but I just couldn't stop adding more and more details. I write the story in my head as I paint and then my brush just won't stop. 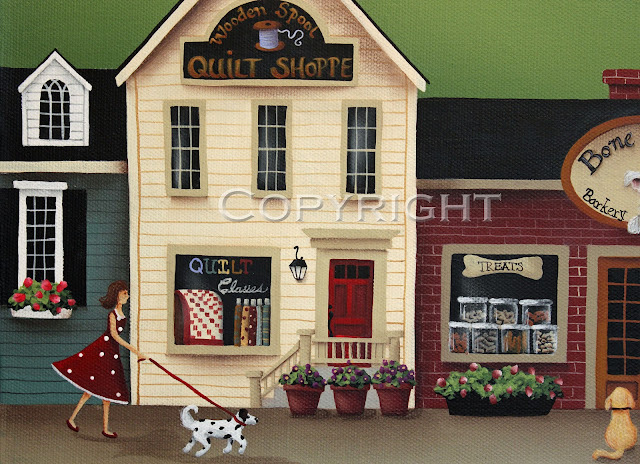 A lady walks her little dog toward the Barkery wearing her favorite red and white polka dot sundress. 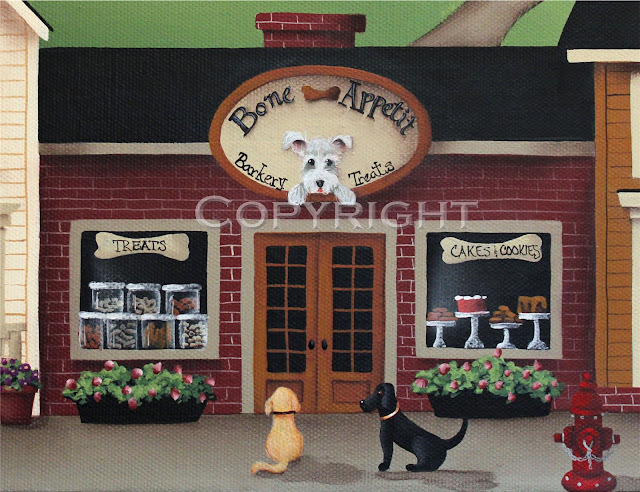 The sign above the door and all the dog treats in the windows are creating quite a stir outside the entrance of the shop. I still need to come up with a name for this painting when I finish it next week. Hopefully that will pop into my head when I finish writing the story. All suggestions welcome! Thanks for the two paws up! I will forever love your houses and towns, when I watched you paint at Steph's you made it look so easy. I haven't painted one for awhile now, but maybe sometime this year. Thanks for sharing the development of this painting, it has been fun watching it come to life! I loved teaching at Steph's Eileen and I'm glad it brings back such good memories for you too! I will never forget it, that is for sure, so happy I got the chance to take that class. What a great name for a Barkery! Too cute! So it's not finished until the brush says so? That's pretty cool. Thanks Vee! The brush seems to be working on it's own lately. Oh my your painting is amazing! I love all the details, Bone Appetit :-D What a fun talent to have!! Catherine, having dogs myself...I ABSOLUTELY LOVE this piece. The details you have added are so sweet, just wonderful. Love the dogs in the foreground. Just ADORE this, Cathie!!! My little Bear would be yippin' up a storm to sniff up that bakery :) As always ... your paintings make me want to climb right into them.